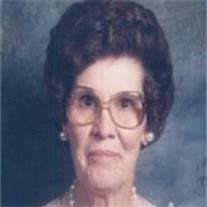 Helen Hallsey Dunlap passed away February 18, 2010, of natural causes. Helen was born August 13, 1917, in American Fork, Utah, to Ella Erlynne Clark and James Franklin Hallsey. She was the youngest of four children. She graduated from American Fork High School and worked as a telephone operator, before she was swept off her feet by a handsome southern gentleman, Warren Dunlap. They were married in the Salt Lake Temple August 17, 1938, and treasured their membership in the Church of Jesus Christ of Latter-day Saints. Warren built their home in Salt Lake where they lived for the next 50 years. Two daughters were born, Carolyn and Pamela. Helen was a devoted mother and homemaker. Warren and Helen opened their home and entertained often, making it an art. She loved beautiful things and kept an immaculate home, teaching her daughters the fine art of cooking and homemaking as well as the principles of the living gospel of Jesus Christ. She held many positions of service in the LDS Church. Helen worked at Auerbach’s department store for over twenty years, where she kept her daughters outfitted in style. Her greatest joy was her grandchildren, to whom she was doting and devoted. Her over night sleepovers are memorable even to this day in the minds of those who received of her pampering. In her later years she moved to Mesa, Arizona, to be close to her younger grandchildren, and she made sure they had plenty of homemade macaroni and cheese. Her style and grace have charmed those who had the privilege of knowing her. A special thanks to Patti and Jim Jones and family, who have been special angels to her and cared for her, as if she were a queen, at the end of her life. She is survived by her daughters, Carolyn Goodworth Ford, and Pam D. Agren and son-in law Dr. Stuart Agren. Grandchildren are Kristin G. Haderlie (Scott), Shannon G. Bray (Scott), Warren R. Goodworth (Allison), Megan G. Richards (Weylin), Jennifer A. Barbier (Geoff), Stacy A. DeLange (Eric), Carl S. Agren (April), Katie A. Andersen (Mark), Jessica Agren, Clayton Agren, Austin Agren, 35 great grandchildren and one great-great-grandchild. Helen was preceded in death by her husband, Thomas Warren Dunlap, and three siblings, James Floyd Hallsey, Alice Nielsen and Mildred Peters. Also preceding her in death were granddaughter Allison Goodworth Burton and great-granddaughter Bridgette Lilly Andersen. We will miss your beautiful smile, your pleasant spirit, and your enduring love. Viewing at Bunker Mortuary, 33 North Centennial Way, Mesa, AZ, 6:30 to 8:30 p.m., Tuesday, February 23rd. Funeral services will be held at Wasatch Lawn Memorial Park , 3401 Highland Dr. , Salt Lake City, UT, at 12:00 noon, Thursday, February 25th, with a viewing at 11:00 a.m.